The reality is that Gold has been in a Bear Cycle since the top in 2011 and over the past year or so has been attempting to establish a base pattern from which to bottom out and emerge back into a Bull cycle. However, the technical evidence does not yet support the Bull case and in fact suggests there is still potential for a final drop to the $1,050 per ounce area before a final washout low takes hold in 2015. With that said, we are not biased in either direction and prefer to let the price action dictate our views and not our personal biases. 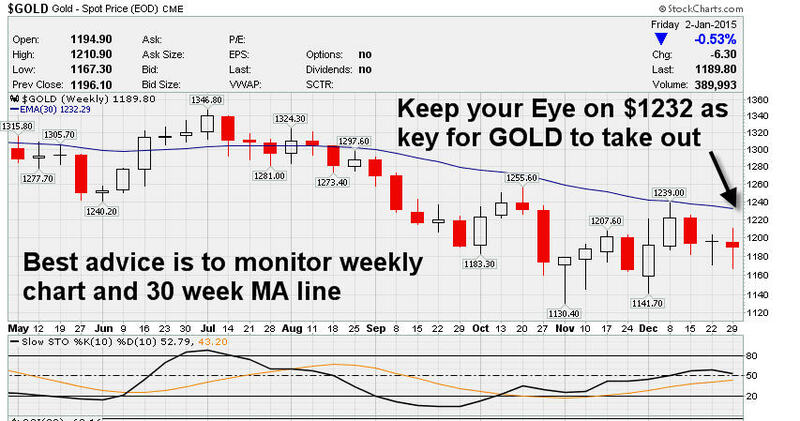 We think a close over $1232 would represent a bullish change in direction as it represents the 30 week moving average line on weekly charts. We like to use this big picture charting for both the SP 500 and Gold because frankly its simple and it works. Yes, we can drill down on Elliott Wave patterns with the best of them and we do so as appropriate, but for the purpose of the general investing audience lets avoid that boredom and short term labeling issues and just focus on the big picture. Now let’ts take a quick look at the SP 500 index. We have been calling this Primary wave 5 of the Bull cycle from March 2009. Others may certainly disagree but our view is for a low end target of 2181 and a high end target of 2525 for the SP 500 before Primary wave 5 ends and we start another bear cycle. We are certainly willing to adjust our views based on action but those are our current intermediate to longer term forecast points for the SP 500. Shorter term, keep an eye on that “Gap Fill” area on the daily SP 500 charts around 2012-2015 as likely to fill as early 2015 trading gets underway. We caution our stock trading and market forecast subscribers that early January volatility is notorious and caution is warranted in the first few weeks until we see where the rotations are taking place , tax selling ends, and other changes are completed by portfolio managers. Then of course earnings start coming out, so January as a rule is tough for most investors and traders.